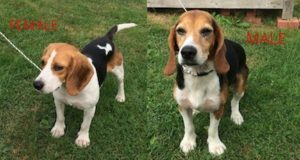 Additional Notes: FEMALE: Beagle, adult, tan, black and white coat, not wearing a collar. MALE: Beagle, adult, tan, black and white coat, not wearing a collar. BOTH found roaming on Sept.3/18. Thanks for sleuthing around to find these dogs in hopes of making a match. Unfortunately, if you look at the colouring of Zack’s left elbow, white, and compare it to the found male dogs elbow, you’ll see this dogs elbow is brown/black. Also, the found dog seems quite shorter than Zack and older. However, the marking on the nose were similar. Thanks for trying, always appreciate the help.